Earlier on the website I wrote an article about two famous companies in the HK garment industry which shared the “Smart Shirts” name although one is the name of its famous product while the other is the firm’s name. As it turns out, two famous HK knitting factories also shared the exact same Chinese name – 建成織造廠. The first one – Kin Shing Knitting – was founded in 1955 and collapsed in 1965 while the second one – Ken Shing Knitting Factory – founded in 1965 by the Shea/Hsieh family from the Fujian province and its successor firm Ken Yuan Knitting remains a leading knitwear manufacturer today. 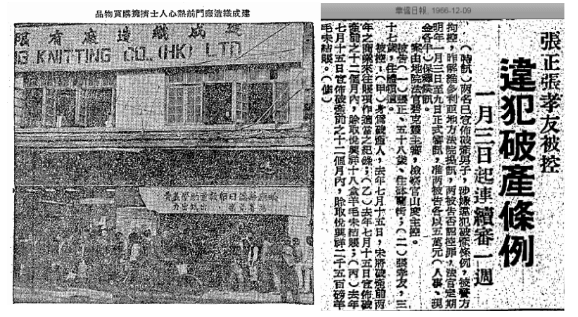 Left: Picture of shoppers outside of the Kin Shing Knitting factory at 62 Castle Peak Road in Sham Shui Po during the charity sale (WKYP, 1964-1-19); Right: article about Kin Shing proprietor Cheung How-yau’s bankruptcy case. As discussed in previous articles, easy credit fueled the growth of many companies in the early 1960s and when the banking crisis triggered by the collapse of Ming Tak Bank and Canton Trust & Commercial Bank hit in 1965, many companies and factories in Hong Kong were negatively impacted. Kin Shing Knitting was another example of this boom and bust cycle in the 1960s. A native of Nanhai in Guangdong province and educated at Fu Yan College, Cheung How-yau (張孝友, 1929-?) and his father Cheung Ching (張政, 1908-?) started Sun Sang Co (新生行) to import wool and Kin Shing Knitting to export garments at 4 Wing Lok Street in Sheung Wan in 1955 with HK$80000 in capital. Business was profitable from the start and soon they added Sun Sang Hong godown at Portland Street. As explained by Cheung in his bankruptcy proceedings, while the wool import business was good the cashflow situation was suboptimal since manufacturers tended to be slow with their payments and he was attracted by starting his own factories by the higher margin. In 1957, Kin Shing opened a retail outlet at its premise at 62 Castle Peak Road, selling its woolen gloves and other knitwear products to local customers. In 1962, the Cheungs acquired factory space at Cheong Fat Building at Un Chau Street in Sham Shui Po for $104,000 and opened Sun Sang Knitting Factory (新生毛衫廠, as a company however Sun Sang Knitting Factory Ltd was incorporated in 1964) at a total cost of $350,000. Business was successful so in February 1963, Kin Shing opened another factory at nearby Wing Hong Industrial Building (developed by Lynhall Land in 1961, see article) at the cost of $165000. Aside from the Cheungs, also involved in Kin Shing was director Lo Sut-hing (盧述卿, d. 1971), an active social leader who was vice chairman of the Taoist temple Ching Chung Koon and supervisor of the Society of the Natives of Chaolian (潮連同鄉會). On the surface, Cheung How-yau and Kin Shing was doing well. 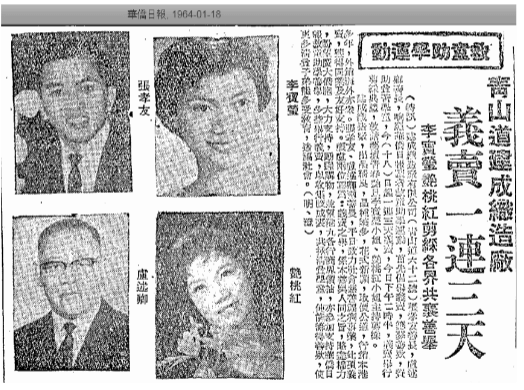 In January 1964, Kin Shing conducted a high profile 3-day charity sale with the assistance of two Cantonese opera stars – Lee Po-ying (李寶瑩) and Yim To-hung (艷桃紅) and the first day generated $5000, with one of the buyers being Tse Yee-chee of Kwong Hing Tai Garment (see article). Two months later in March 1964, Cheung was even elected a committee member of Po Leung Kuk, a leading charitable organization in town and a status symbol for Chinese leaders. Beneath the surface however as revealed by bankruptcy proceedings, the house of cards was supported by a large accounts receivable and payable and loans from banks and friends at 2.5-3% interest and by 1964 the liabilities had exceeded HK$1.5 million. The banking crisis of 1965 prompted many creditors to call on their loans and unable to meet their obligations, Cheung How-yau and his father declared bankruptcy in July 1965 and the legal proceedings dragged on in bankruptcy court in 1966 and 1967. As a firm, Kin Shing Knitting dissolved in February 1965 while Sun Sang Knitting dissolved in November 1966. Ken Sheng was founded by and named after Hsieh Wen-chung (佘文宗), whose alias was Hsieh Ken-shing (佘建成). 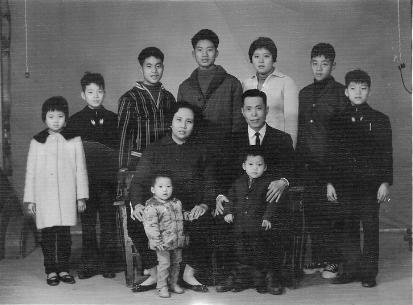 A native of Quanzhou (泉州) in Fujian province who started out as a peasant working menial jobs, Hsieh Wen-chung was arranged to marry Hung Foon-Te (洪寬治), who came from a wealthy family and together they had nine children. After the change of regime in the mainland in 1949, Hsieh came to HK and worked hard to support his large family. In 1965, he saved up enough to start Ken Shing Knitting Factory (although it was not incorporated until 1982). He was supported at Ken Shing by his wife and their six sons (English spelling of names based on Directory of HK industries) – Shea Ming-lit (佘明烈), Hsieh Ming-yin (佘明賢), Hsieh Ming-chiu (佘明釗), Shea Ming-tat (佘明達), Armstrong Shea Ming-chung (佘明聰) and Hsieh Ming-fuk (佘明福) and three daughters and by the 1980s, Ken Shing had emerged as one of the largest knitwear manufacturers in HK with annual turnover of over HK$100 million. In the late 1980s, Hsieh Wen-chung and his wife passed away at the age of slightly over 60. His fifth son Armstrong Shea was made managing director of the firm and under his leadership, production was relocated to the family’s hometown of Quanzhou. in 1990, the group spun off Ken Yuan Knitting (建源織造廠), which specializes in hand-knit, hand crochet and macramé. Today, Ken Yuan under the leadership of Armstrong Shea, his wife Rita and children Aaron, Sara and Sharon remains a leading knitwear manufacturer and has supplied to major US/European brands such as Brooks Brothers, Polo Ralph Lauren, Donna Karan, DKNY, TSE, Laura Ashley, Casual Corner, Talbots and Nordstrom. This article was first posted on 22nd March 2019.